When I first spotted the Evernote integration feature inside Redbooth, I’m pretty sure I fist-pumped in my office. As an Evernote Business Certified Consultant, I was in the process of finalizing plans to guide my biggest client — a busy visual design firm in Sioux Falls, SD and already a happy Redbooth customer — through the exciting step of adopting Evernote Business as well. Last fall, I had walked them through the process of upgrading their workflow management from a combination of a task-management tool and email to Redbooth’s collaboration and communication platform. As a result of implementing Redbooth, they had experienced such a substantial productivity boost that they were able to grow their client base without needing to bring on additional team members. Buoyed by that success, we were excited about what else might be possible. With the additional business, the firm, Matt Jensen Marketing (MJM), was coming up with more great ideas for campaigns and designs. The energetic creative team worked by generating a lot of options at first — to get the best ideas, the more, the better! Then they would work closely with the client to hone in on the one or two most exciting ones move forward with. But the rest of those great ideas? They got left behind on the cutting room floor. These ideas were the product of great effort and talent (and occasionally some late nights and strong coffee). But if they weren’t selected to advance for a particular campaign, they had no further life cycle. The abandoned ideas were scattered on local hard drives, stuck as attachments to old emails, or just deleted. We realized that Evernote Business could turn this “Great Ideas Boneyard” into a flexible, searchable visual library that could be leveraged as an amazing resource for future projects and initiatives. The thought of combining instant access to this library with Redbooth’s real-time communication capabilities was exciting. It would also give the team the ability to access all of those ideas during a brainstorming session — a great way to keep the momentum of the creative process going. And that was just the beginning. The team’s daily workflow was already working well in Redbooth. Now it would be possible to use Evernote in close coordination with the systems they already had in place. The team was eager to reap efficiency gains by leveraging the old work to springboard the creation of new ideas. Integrating Evernote and Redbooth was a simple process. Team members with personal Evernote accounts were able to link those accounts to their new Evernote Business accounts while continuing to keep all of their personal Evernote data private. After everyone was set up with Evernote Business, it took just a minute for each person to go into their Redbooth account settings and link the two accounts. Once that was set up, they saw how easy it was to include an Evernote note within a Redbooth workspace. All they had to do was click on “attach files” inside of a Redbooth workspace, choose Evernote as the source, and then select a note. That’s it! This process actually generates an in-line version of the note, right inside of Redbooth. The neatest part is that the note updates dynamically. This means that if the Evernote note is updated after it’s attached in Redbooth, the thumbnail will update too. This means that everyone on the team will always be working off the most current version of the Evernote note. When MJM account reps meet with clients, they talk about many different aspects of a project: copy, design, ideas for future projects, and more. In other words, there are essential takeaways for many different team members, even from a single meeting or call. Before, this meant that each rep was in the habit of sending out emails that could easily get lost or overlooked. Now, with the Redbooth-Evernote integration, account reps draft meeting notes right into Evernote and attach the note in the relevant Redbooth workspace. If specific action items come out of a meeting, a rep can easily attach the Evernote note to related tasks. Not everyone attends client meetings, and but even those that don’t attend can see see the full context for their action items. There’s no need to re-type instructions or explain context: just attach the Evernote note, make sure it’s clear who owns the next step, and go. That makes busy account reps happy, and gets the work assigned out with no administrative delays (which makes everyone else happy, too). At MJM, writing copy is an intensely collaborative effort. Previously, managing the editorial process through emails and attachments meant that version control could get complex. In fact, writers often found themselves with extra work: the chore of synthesizing edits on multiple documents into one master file. Now, the writers draft their marketing copy right into Evernote, where they have easy access to any other examples or sources of inspiration they might have saved there. When the copy is ready for editing and review, it’s attached to a Redbooth task and passed through the editors. Everyone can see state of the copy at a glance — and where it is in the review process. When the copy has been finalized, it’s assigned to the designers. The entire process is transparent and efficient. Redundant editing efforts are a thing of the past. Even better: if anyone has a question during the process, they can reach the writer immediately using Redbooth, where they can also share a link to the context in Redbooth (where the related Evernote notes are embedded) with a single click. Best of all, there are no more version control hassles with multiple copies of word processing docs languishing in email inboxes. 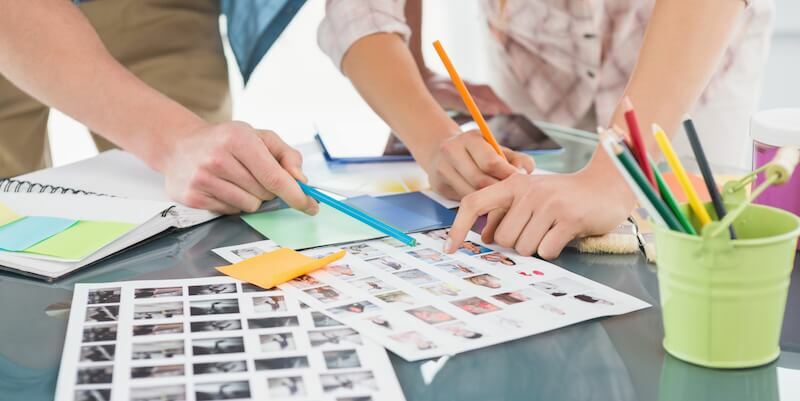 The feedback process for graphic design requires that words and images live side by side. In this new system, the team’s graphic designers attach their images in Evernote and add them to Redbooth workspaces for the team to review and respond to. The beauty of this process is the real-time notifications — absolutely essential at a fast-moving firm where everyone is working under intense deadlines. When a new note is attached in Redbooth, automatic alerts are triggered within Redbooth. When a team member is out of the office, the same alerts will show up on their smartphone or iPad as well. Everyone who needs to know will be aware that there’s an update as soon as it happens. It’s an ideal combination: Evernote houses the image files, screenshots and annotations — even audio files of the creative director’s feedback sessions — and Redbooth embeds the note right into the workspace. And if the executive team wants to take a look and see the progress on a particular campaign, they only need to look in Redbooth — no switching back and forth between different apps. With the screen-sharing feature, it’s a breeze to loop in a traveling exec in real time. Back when almost everything lived in email, it was time-consuming to reference — or to even find — older information. Now, everyone at MJM communicates more efficiently within the Redbooth workspaces. Including context is faster than ever before. Now with just a few clicks, Evernote notes with information about the history of the project, feedback from the client on previous projects, and examples of previous work can be included. The time and energy that was getting drained as team members searched through email records and opened attachment after attachment has been successfully reclaimed. Everyone at MJM is delighted with the impact that the combination of Evernote Business and Redbooth has had: better oversight for the executive team, productivity gains for the designers and writers, and increased efficiency for the team leads. With these new competitive advantages locked in, we’re excited to see what the coming year has in store!